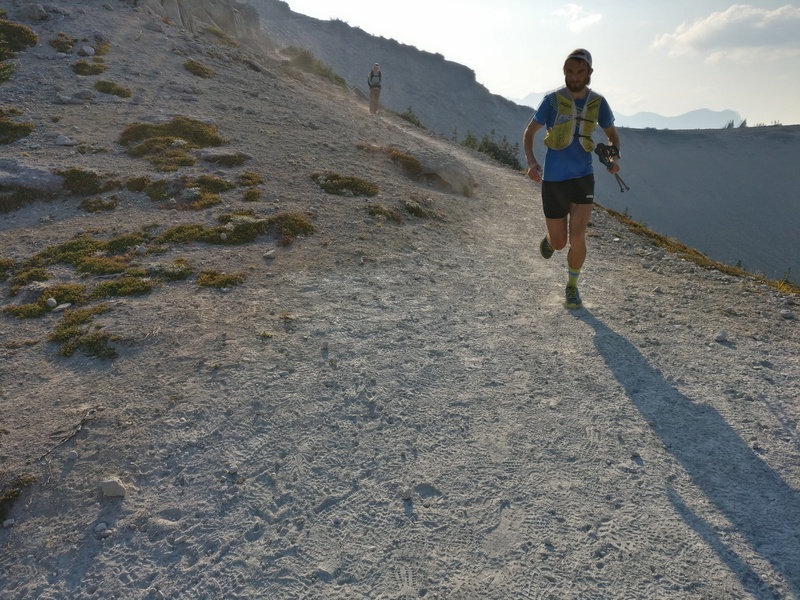 The idea of pacing is stressed fairly often in the world of ultrarunning. With my runners I coach it’s probably the point I hit hardest on before any race. Up until the Wonderland Trail this year I had not actually had the greatest success in 100ish mile races in this department. 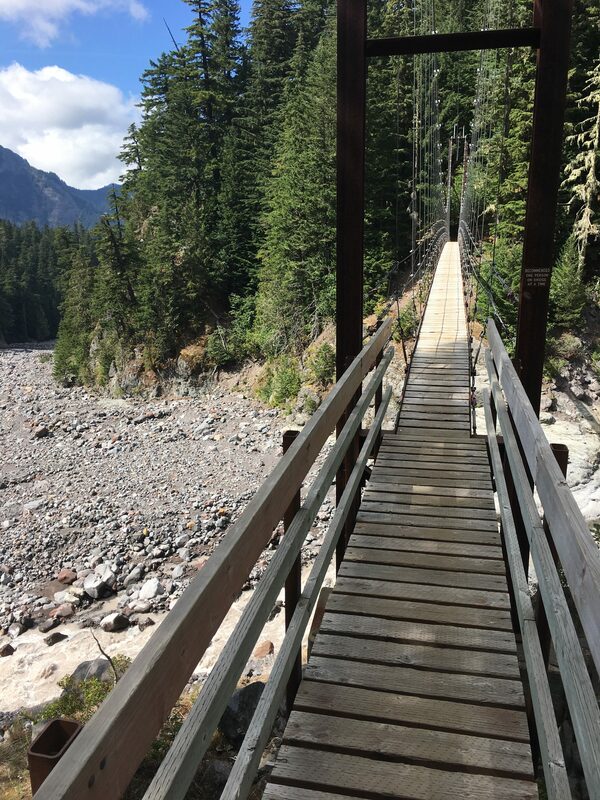 I made it my express goal to reach Mowich Lake (mile 34) in such a way that I felt like I was just getting started, a rather ridiculous notion after climbing over 10,000ft. Through a level of patience I’d never exercised in a race I managed to do just that. Hiking the vast majority of the climbs, and never mentally pushing I arrived to a fine meal that Natalie had served up on the picnic bench at the top of the climb. I was able to take in around 700 calories of various types of food, no gut problems even for a minute during the first 7 hours. Thanks Spring Energy! I was 5-10 minutes behind Gary Robbins record split but I didn’t think too much on that, I was ready to get rolling. Anyone who has run a really long way knows that controlling your mind during hours and hours of running is a monumental task. More often than not in my racing career I have found myself dwelling far too often on extrinsic goals (like setting a record) in the midst of the race. When things get hard these kinds of goals become demons, causing you to get derailed. If the goal is to get a record, and your body starts degrading, it’s easy to lose the confidence and motivation to forge on. I did my best to make goals that were executable in the moment during the Wonderland. I forced myself to care about how I was performing in ways that I could control no matter what situation I was facing, and for the most part this seemed to work really well. I was able to push fairly hard from mile 34-58, having saved a great deal of energy in the first segment. This was the plan, and it was working. The sun was just beginning to go down as I descended into the White River Campground where I met Natalie for a second time, just over 12 hours into the run. My GI system was functional, an asset that I have not been able to use late in many of my 100 milers. I downed a full pack of ramen, a quesadilla, oreos, all totaling 500+ calories, in 7 minutes, and then I was gone into the evening light across an angrily frothing White River, approximately 10 minutes ahead of Garys split now. So much good and bad could still happen of course, with about 30 miles remaining. Darkness fell as I reached the top of Panhandle Gap (mile 67), the 6,800ft high point on the trail. Having been able to eat so well at the previous aid station was huge. The climb flew by, only taking me 3 minutes more than when I’d done this section fresh in a training run a few weeks before. I didn’t know this at the time, but I did know that I was moving better than I ever had this late in a long ultra. The next and final aid station at Box Canyon (mile 77) would give me a really good idea if I would get the record or not. I pushed as hard as I could, even blowing up in a massive head over heals fall, landing upside down on my back with a monster calf cramp to complete the move. The scene would have been quite peculiar to any human or animal onlookers in the dead of the night. Shaken, but not broken, I got up and moved along. Approaching the road and seeing Natalie’s headlamp then looking down at my watch I knew I was far ahead of where I needed to be, and only a massive screw up would cost me the record now. Even though I still had 13 miles and a big climb/descent combo left, I pretty much knew I had the record locked up. In retrospect it’s easy to see that forgoing UTMB or any other late summer 100 mile race for the sake of giving everything I had to the Wonderland was a good idea. If I had not gotten the record I suppose it would have looked like a mistake, or a failure. 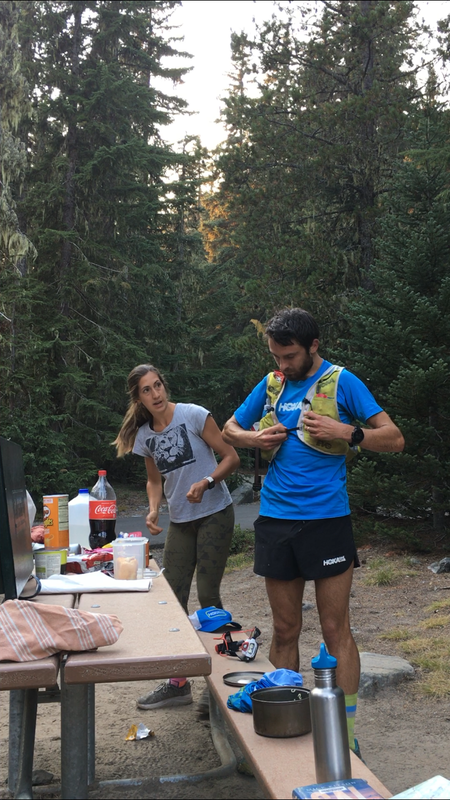 Of course I am happy I was able to come in under Gary’s time of 18:52, establishing a new FKT in 18:27:42 (Strava data here). Even if I had not, I doubt I’d see it as a mistake. I truly love this trail, these mountains it traverses, and the experience of racing against the clock. Of all the records I’ve ever had the privilege to break, this was by far the longest and most arduous. It gives me a lot of courage and confidence to step out farther in the summers to come. David and I sat down and got into the Wonderland a bit more. If you’ve got ten minutes hit the play button. Let us know what you think in the comments on the video! I would be remiss if I did not mention HOKA ONE ONE. Their support and unrivaled trail running shoes are a big part of why I am able to chase records like the Wonderland FKT. The Evo Mafate was my shoe of choice (as it is for many sponsored and unsponsored HOKA runners around the globe). I can honestly say my body and feet held up better to the punishment of this run than they had in any previous long ultra I’ve done. Thanks to my wife for her constant support on and off the trail. Without her crewing efforts I had no chance to break this record. And thanks to everyone who has read my articles and followed along with my running journey over the years. Now it’s time for a relative break from racing. This fall I will be taking part in a few different adventures and new challenges, but not big races. It’s a great time to reset and refocus for the many miles and hours that will need to be done before next summers mountain racing season arrives.